State Representative Dr. Joe Bouie joins Captain Shannon Marks on board for the official "CRPPA Pilot Experience." Together, in their respective areas of expertise, both serve our great state and its citizens. This is what Representative Bouie had to say about his time on the river. "My experience on the Mississippi River with the Crescent Pilots was an exhilarating one I won’t soon forget. The adventure began with a trip on the crew boat which led to climbing the ladder onto this massive vessel. From here, I was able to see Captain Shannon Marks in action. 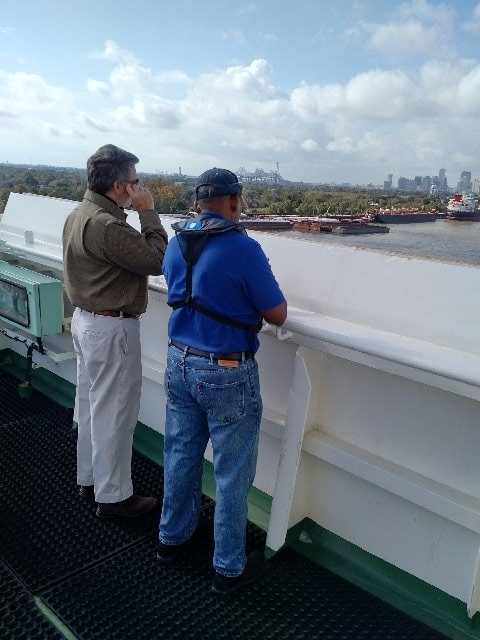 From my view on the top of the ship overlooking the Mississippi, I witnessed this pilot moving his ship up the river with great precision and even docking our vessel in what was a very rough day on the Mississippi." Rep Bouie further noted "The Crescent Pilots do a fantastic service for the state of Louisiana. I would encourage all elected officials to take a ride on a ship with a state commissioned pilot". Some of our elected officials who have participated in the official "CRPPA Pilot Experience" include: Representative Dr. Joe Bouie, Senator Sharon Hewitt, Senator Beth Mizell, Representative Tanner Magee, Representative Jean-Paul Coussan, Representative Thomas Carmody and Representative Paul Hollis.